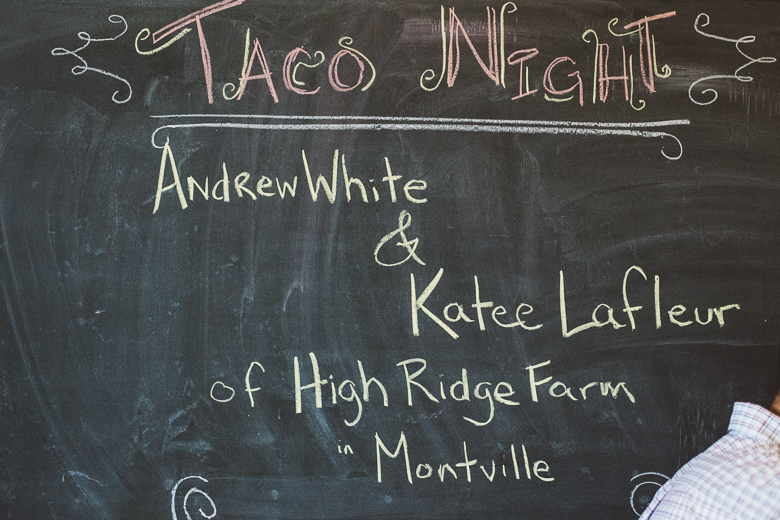 This recipe comes from Andrew and Katee at High Ridge Farm in Montville, who whipped up a taco feast for MFT’s second (sold out!) Schoolhouse Supper at The Hub. The recipe is easily adjusted with black beans used as the filling instead for vegetarians. Unity Food Hub sourced the ingredients for the Supper; do your best to support your local farmers and buy local! Get yourself some good tortillas (like Pachanga). For the steak: Flap steak or skirt will work. We actually prefer flap because it’s cheaper and thinner. Ask your butcher for some grass fed flap and tell her you’re gonna make tacos with it. Marinate steak with one cup of vinegar per pound of steak, a dollop of maple syrup, garlic, little salt, lemon, and enough water to submerge the meat. Let it marinate in the fridge overnight. For the salsa: Broil a bunch of green tomatoes until the skin is super charred. Let cool, and peel off skin. Throw in blender, food processor or immersion blend with raw garlic, jalapeno, lemon, vinegar, salt, touch or cayenne pepper to taste. Let sit at room temp. Take steak out of marinade. Either char each side on grill, or put a cast iron skillet on super high heat. Get it flaming hot. Salt and pepper each side of steak. Throw on skillet. Do not touch for five minutes. Flip. Do not touch for five minutes. Take off, put on cutting board let rest for 15 minutes. Bonus step: Reduce marinade in pot, on stove. Now you have a reduction sauce for anything you might want. Dice a white onion super fine. Chop cilantro, slice radish, whatever else you fancy. Turn burner on medium flame. Put tortilla directly on flame until starts to smoke, take off before it catches fire. Flip. Repeat, remove and keep warm in towel. Make as many tortillas as you need this way. Slice the steak thinly against the grain. Put in tortilla with other goodies. Check out our next Schoolhouse Supper on August 31st, with Anders Tallberg of Roustabout.